The submarine could be Type 094 or Type 093, but not the next generation nuclear-powered ballistic submarine Type 096, since Type 096 is too advanced and not to be completed soon, Song Zhongping, a military expert who served in the PLA Rocket Force, said. Beijing: China has added a new nuclear-powered submarine to its fast expanding fleet but experts believe that it is not the most advanced version as speculated earlier, official media reported today. The new submarine is stated to be 69th conventional and nuclear submarines, according to unofficial estimates by global defence think-tanks. A new nuclear submarine has been turned over to the People's Liberation Army Navy (PLAN), state-run Global Times today quoted an official with the China Shipbuilding Industry Corporation or CSIC as saying. However, experts believe that this submarine is not the most advanced Type 096, which is China's next generation strategic nuclear submarine, the report said. The submarine was built at the Dalian shipyard which also made China's second aircraft carrier, currently under trials. However, the shipyard did not reveal the submarine's name and type, it said. But some Internet users and military enthusiasts speculated the submarine is Type 096, China's most advanced nuclear submarine and the successor of the current Type 094, which first appeared on China Central Television in 2013, the report said. 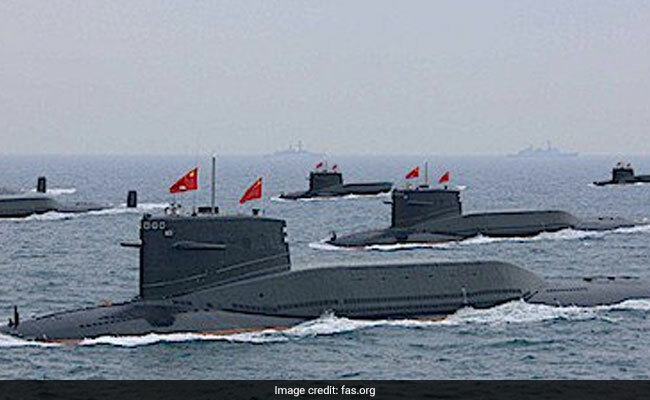 The submarine could be Type 094 or Type 093, but not the next generation nuclear-powered ballistic submarine Type 096, since Type 096 is too advanced and not to be completed soon, Song Zhongping, a military expert who served in the PLA Rocket Force, told the Times. The strategic nuclear submarine, also called a nuclear-powered ballistic missile submarine, is capable of launching nuclear warheads from the sea and can provide "a second strike" to a country in nuclear warfare. The nuclear submarines provide the nuclear triad, which means when the enemy has completely destroyed land-based launch positions, the submarines stationed at different far off locations take over. Last year, India achieved nuclear triad capability after the launch of first indigenously built nuclear submarine INS Arihant which provides the "second strike" capability for India's military. Under the massive reforms being carried by the Chinese military, navy is being given a prominent role over above the Army and Air Force to expand China's global power. The 2017 Annual Report to the US Congress on China's military power by the US Defence Department claims that China's next-generation nuclear submarine, Type 096, will likely begin construction in the early 2020s, and will reportedly be armed with the JL-3, a submarine-based ballistic missile.